Veggie burger recipe : 1 can drained and rinsed black beans mashed with a fork. To this you add about 1/2 choppedwhite or red onion, 1 cup cooked brown rice or quinoa, 3 minsed cloves of garlic, 1/2 cup chopped cilantro,1 tbsp chili powder, a squish of sriracha (optional) and salt/pepper. Mix together and add 2 egg whites. Mix again and form into 4 big patties. Bake at 375F for about 20 minutes. 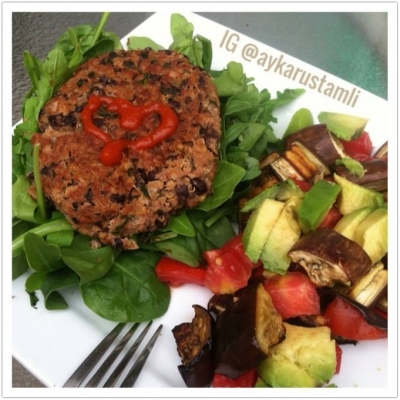 I served mine on top of spinach/arugula mix and with grilled eggplant, fresh tomatoes and avocado. Drizzled everything with balsamic vinegar/lemon juice mix. Yum.